Here at SLM Toyotoa Uckfield we are very happy to welcome Daniel Goldsmith to the team as a Service Advisor. 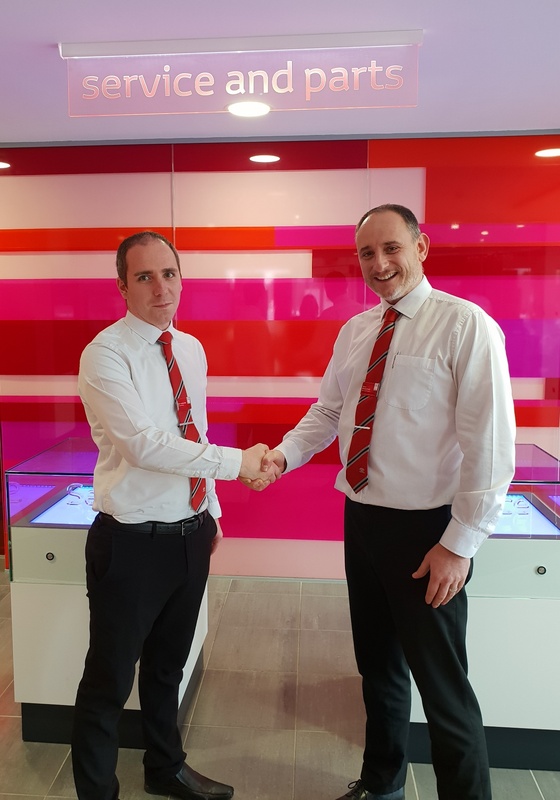 Pictured above is Vince, Our After Sales Manager welcoming Daniel (left) to the team. Daniel has only been with us for one month but is already becoming a great asset to the team. His first job within the motor industry was sweeping the floors at a local garage on a Saturday morning. He then moved into a parts department which sold and specialised in Morris Minor spares. After this, he moved to the service team at an Audi main dealership before joining SLM. Daniel was keen to work at SLM Toyota because he believes it "will be the forefront of 'green' alternatives to transport." His favourite part of the job is "making sure customers cars are in great running order and helping people with any issues their vehicle may have." His favourite car in the Toyota range is the Corolla, "particularly the older rear wheel drive versions." His very first car was the Fiat Seicento. In 2019, Daniel is looking forward to "attending some Toyota courses and learning more about the current range of cars and what the future holds." Outside of work, Daniel is a keen motorcyclist and enjoys playing and watching sports, including football and tennis. Everyone at SLM would like to welcome Daniel to the team - we are all looking forward to working with you!